Are you in Oakland County, Michigan and searching for quality residential and commercial carpet cleaning services? Capital Carpet offers a complete line of carpet cleaning services including spot and stain removal, pet odor removal, and area rug cleaning. 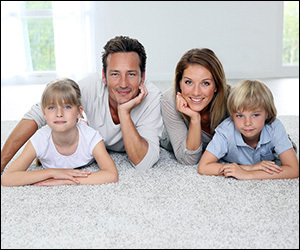 At Capital Carpet we have a team of professional technicians who average over 10 years of experience in the carpet cleaning industry. They understand how to properly use their carpet cleaning equipment and get great results removing carpet stains and odors. Capital Carpet uses modern truck powered steam cleaning equipment and the latest chemical developments to insure a deep clean for your home or business carpets. 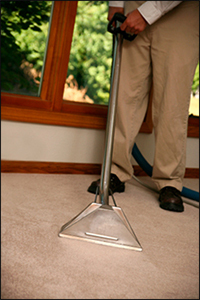 Our carpet drying times are usually very quick and we will move your furniture before we clean your carpeting. Capital Carpet will pre spot stains and clean your carpeting's corners by hand for superior results. We offer carpet fresh scent with all of our carpet cleaning services and Scotchguard is available for extra protection. 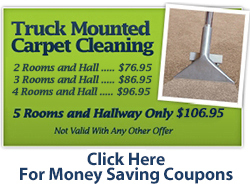 Our current carpet cleaning pricing specials are listed below. 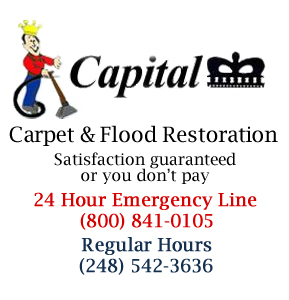 If you are searching for professional residential or commercial carpet cleaning in Oakland County, Michigan call Capital Carpet today at (800)841-0105. We offer a complete line of carpet cleaning services including area rug cleaning, pet odor removal, spot and stain removal, and our carpet drying times are fast.